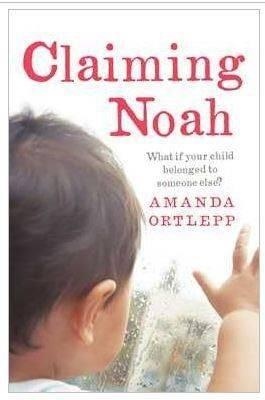 I must admit, when a copy of Amanda Ortlepp’s debut novel, Claiming Noah, arrived in the post, I wasn’t sure I wanted to read it. My reluctance wasn’t due to the subject matter. I devoured both of Dawn Barker’s books, Fractured and Let Her Go, which deal with similar difficult subjects, including post-natal psychosis and issues relating to a child’s true (or legal) parentage. I just wasn’t sure I wanted to traverse similar territory in another novel. Nevertheless, amid all the excitement of releasing my own debut novel this week,* I persisted, and I’m happy to report Claiming Noah is worth the read. In Claiming Noah, Ortlepp creates a very Solomon-esque story in a contemporary setting, and teases it out to a tense and satisfying conclusion. Her point-of-view characters are Catriona, the donor mum, and Diana, who adopts Catriona’s embryo; both are sympathetic characters who go through a very rough time and deserve better. They have problems with husbands, newborns and adjusting to dramatic changes in their life circumstances; both suffer tragedy and deception which cause them heartache and take them to the brink. At times when reading I found myself pulled out of the story thinking, She wouldn’t do that. Why doesn’t she…? But it’s a credit to Ortlepp that she is able to bring her characters to life so well that I began think I knew them! Claiming Noah is billed as a thriller, but I think it’s more mainstream than that: I wouldn’t put the “thrills” at much more than you’d find in suspense (which is fine by me). There’s nothing externally life-threatening in this story; the life challenges, when they come, stem from the characters’ inner worlds, and the impact of external events on their psychological and mental health, which is only ever really severely tested for Catriona. I read the novel over a few days and it kept me engaged – rather than “hooked” – for that time. (Considering I also had a lot going on with my own release, that’s no mean feat.) The moral dilemmas the novel presents are interesting, even if the references to the Catholic church’s influence seem a little dated. The ethical issues the story raises deserve to be explored. And what better way to explore them than in entertaining fiction? Fans of Dawn Barker’s work won’t be disappointed. A review copy was kindly supplied to me by the publisher. 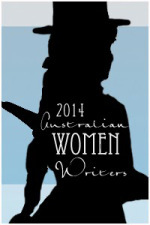 This review forms part of my contribution to both the Australian Women Writers Challenge and the Aussie Author Challenge 2015. * You can read about my debut romance, Snowy River Man, and enter a giveaway to win an ebook copy here. They say the best predictor of future behaviour is past behaviour. For a long time I’ve wanted to write psychological suspense. While pursuing my goal, I’ve read lots of novels in the genre, with the hope of learning how to create the same magic. Whether it’s called psychological suspense, thriller, or “domestic noir”, the stories are often about a woman in jeopardy, or women who are victimised who fight back. Sometimes they’re about men or women who are stretched to the limits of their endurance – even, at times, of their sanity. They are stories I can relate to. It shouldn’t be any surprise, therefore, that when I look back over the novels I’ve read and reviewed this year for the Australian Women Writers Challenge, I find most of the stories fit that category. I confess, though, I’m shocked at how narrow my reading has been. P M Newton’s excellent crime novel Beams Falling, is another one I read; it’s the sequel to her award-winning debut, The Old School. Instead of writing a review, however, I posted a Q & A with Newton on the AWW blog here. I didn’t set out to be so narrow in my reading this year; it just happened that those were the books that appealed to me. 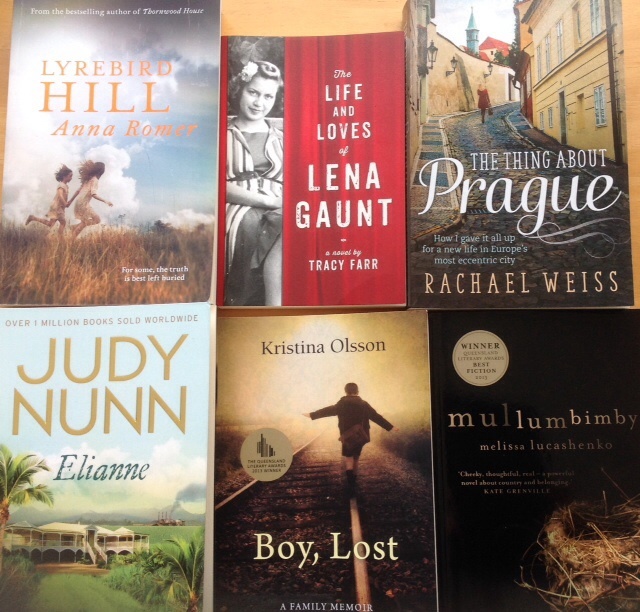 When I look at my “to be read” pile of books by Australian women, there’s a great variety of genre, from literary fiction to memoir to historical fiction as well as nonfiction. The books in this photograph are only a fraction of the pile. By the way, for those of you who haven’t heard, my debut novel – a romance with suspense elements, Snowy River Man – will be published by Escape Publishing on 22 February 2015, under my pen-name, Lizzy Chandler. If you’d like a review copy, please let me know. I’d be thrilled if it could be reviewed as part of the AWW challenge for 2015. Are you planning to join?